I strongly recommend UK Podcast “What would the Smart Party do about..“. EvilGaz and Baz King are diehard gamers who intelligently discuss the topic at hand…and this episode is a good one all about the OSR with guest Dan Sell of the Undercroft fanzine. What the heck is OSR anyway? Damned if I know, so we got the lovely Dan (from The Undercroft fanzine fame) to come and school us like it’s 1987. So come find out what those letters stand for, what the gaming movement is about, does everyone on RPG.net really hate it and much, much more! 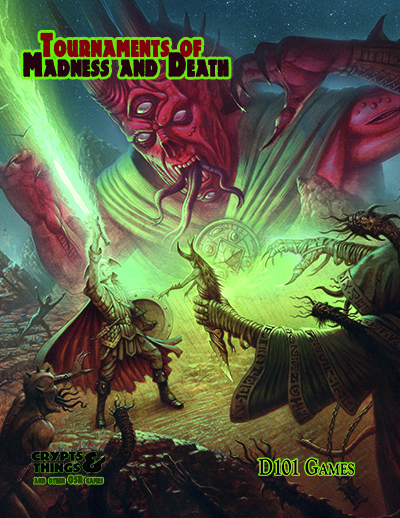 Want a 5th Ed D&D scenario from the gritty Brit School of module writing? Then check out this Kickstarter to fund an adventure called “The Last Prayer of the Dying” for 5E. I’ve backed it since artist Jonny Gray has done various bits for D101 over the years, plus the premise sounds right up my street. Kickstarter is already funded with multiple streatch goals and ends this Saturday. 10 wilderness encounters to get a feel for the setting. A small settlement in the wilderness frontier lands. Three dungeons (each about a dozen locations). 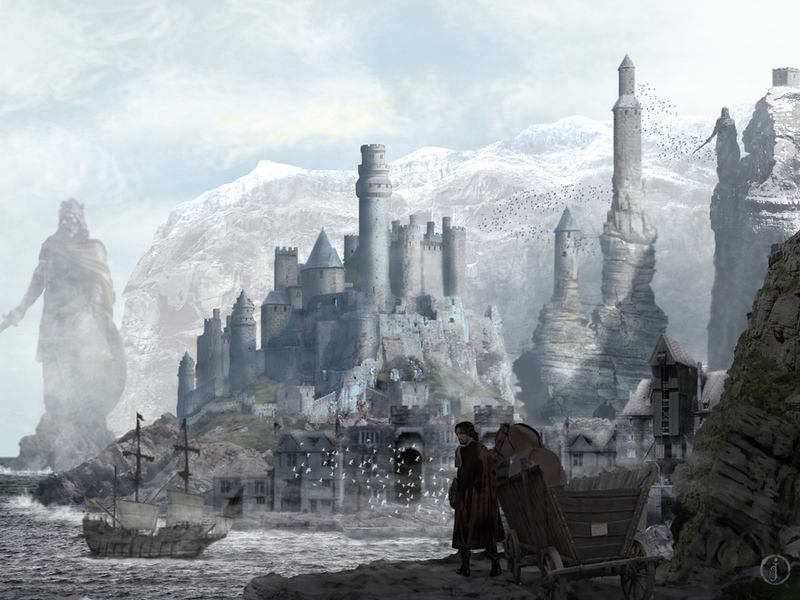 A) The tomb of a mythical knight, now infiltrated by despoiling fey priestesses; B) An old dwarven fort used by hobgoblins who have been driven to the edge of despair by the alluring voice of a bloodrose witch; C) The scheming feys base of operations, from which they seek to begin a reign of chaos and insanity over the newly re-established Duchy of Keranow. An adventure outside the axis of good versus evil: betrayal, treachery, duty and the consequences of choice. If you are on G+ and use hangouts for your gaming and are either UK based or within the GMT timezone, there’s a new group that has just been set up to organise OSR based games within that timezone. I’ve signed up since I’m planning to run some games of C&T and OQ, kicking off some games in the next week or so. From the upcoming Crypts & Things Remastered, one of the Nemesis’ of the dying world of Zarth, from the Scourges of a Dying World chapter. Note this is an unproofed work in progress which may change before publication. While the Serpent Lords sleep, their concubine and Queen Siligra controls one of the remnants of Serpent society from the lost City of Tilcoa deep within the Jagmani Jungles. There she prepares for the day when the Serpent Lords awaken to retake what is theirs. This ruined city full of columns and white stoned buildings, was once the capital of a human civilisation in ancient times, before a disguised Siligra and her followers arrived. Using all her charm and seductive abilities she quickly sowed descent amongst the various factions within the city, which led to a bloody civil war. After the dust settled she took control of the weakened survivors, who descendants over the years became a tribe of degenerate primitives who worship the Siligra as their blond and white skinned Goddess, knowing her only as “She who Should be Obeyed!”. Armour Class:0 Hit Dice:10 Hit Points:50 Attacks: Bite 1d8+Venom, 2 Claws 1d6, Tail 1d10 Special Rules: Venomous bite (Test vs Luck or take 2d20 damage), Assume Human Form + Spells CR15 / XP 2900. 2nd Level: Invisibility, Snake Charm, Web. 3rd Level: Dispel Magic, Fireball, Lightning Bolt, Suggestion. 4th Level: Cauldron of Blood, Charm Monster, Fear, Sticks to Snakes. 5th Level: Commune with Greater Others. 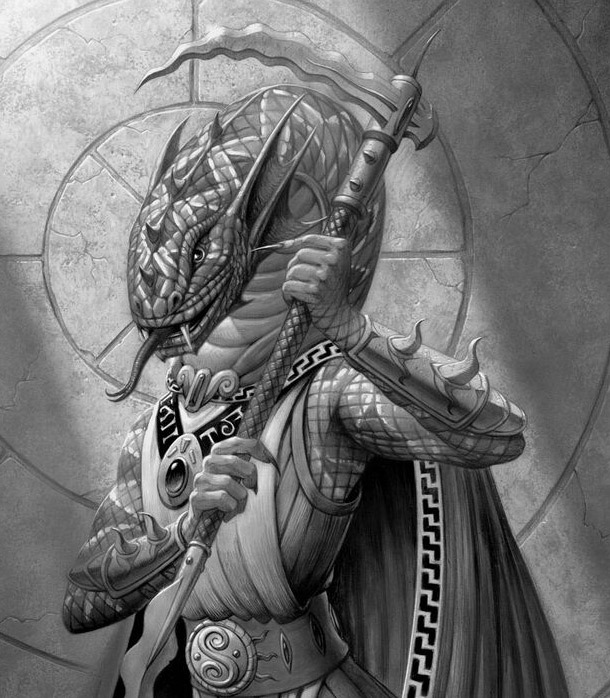 Both Silgra and her Serpent Men followers appear as humans of a fair and noble countenance who rule the savage tribesmen that shelter in the shattered city. They will initially seem friendly and sympathetic lulling the characters into a false sense of security. Then they will either be imprisoned by force, or be fall foul of Siligra’s charm Person spells.Only powerful magic can strip away Silgra’s Human form and reveal her true Serpent Nature. Outside of the city Silgra maintains a network of agents both human and serpentine, who gather information and seek to control the human cities. Personal body guard of 10 Serpent Warriors who are never more than fifty foot away from her. A cadre of 5 Serpent Priests. At least 5 Serpent Scouts (the feared Black Assassins who strike down those who disobey). A group of human cultists who worship the Serpent Queen, no less than 30 strong. A tribe of primitives, degenerate descendants of the original inhabitants of Ticoa. To top it off here’s preiview of David M.Wright’s Serpent Folk picture that will appear in the new rule book.